Coping Robots eliminate manual marking and finishing. Featuring 6-axis robotic arm, Models CRII 7030 and CRII 1040 offer capacities of 28 and 40 in., respectively. Units provide coping, piece mark, scribing, and cutting capabilities, and can process bolt holes, slots, flange thinning, and weld preps in structural steel. Robots automatically compensate 4Â° for natural taper of plasma to ensure straight cuts. With fully enclosed design, robots include fume extraction system as well as pinch roller and push bar hybrid system for material positioning. Elk Grove Village, IL - The first of its kind, Daito U.S.A., Inc.'s new CRII Versatile Coping Robot offers coping, piece mark, scribing and cutting capabilities all from one machine. Functioning automatically, the CRII saves time and eliminates the need for manual marking and finishing. Featuring a 6-Axis robotic arm, the CRII processes bolt holes, slots, flange thinning, weld preps and more in structural steel fabrication, and even in ship building applications. Material is processed quickly, as well as accurately. The CRII robot automatically compensates 4º for the natural taper of plasma to ensure straight cuts. Unlike most competitor coping machines, the CRII is fully enclosed and protects operators from smoke and fume emissions. An included fume extraction system is equipped with a powerful vacuum to remove excess fumes. Also included with the CRII is Daito's Pinch Roller and Push Bar Hybrid System for fast and accurate material positioning. A line discharge feature and a lift and carry transfer system are available as options. CRII Versatile Coping Robots operate as stand alone units, or can be integrated into a fabricating line. Two models of this machine are offered: the 28" capacity CRII 7030 and the 40" capacity CRII 1040. Daito's exclusive DIS software is included. 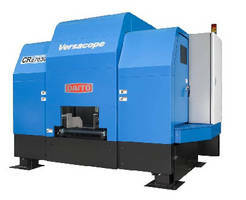 In addition to the CRII, Daito offers a full line of machines for steel fabrication, including bands saws, drilling machines, auto line systems and roller and feeding mechanisms. To learn more about the CRII Versatile Coping Robot, visit Daito U.S.A., Inc.'s booth #1036 at NASCC The Steel Conference in Grapevine, Texas, April 18 - 20.